There has been a stark contrast in responses from Britain in the US following an attack on diplomatic staff in Zimbabwe. The US State Dept spokesman said the issue had been “resolved but not forgotten”. He said that one man amongst the US diplomatic group had been set upon and beaten by Zimbabwe police. Calling the attack outrageous he said Zimbabwe officials would be sought out in Rome where they are attending a conference. He said the issue would also be brought before the Security Council. 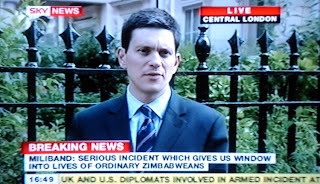 David Miliband, Britain’s Foreign Secretary was far more muted in his response. He said that all the diplomats had been released unharmed and downplayed the severity of the attack. In his short statement he said the incident “gives us a window into the lives of ordinary Zimbabweans”. He said he was worried about the situation for Zimbabwe as a whole. “We have to be concerned about British staff but we have to also be concerned that intimidation does not become the order of the day up until the 27th June” he said. The details of the incident are still not clear with few comments coming from official sources. James McGee, the US ambassador to Zimbabwe, was unable to provide details of the attack but said the country had become “lawless”. US "preparing to strike Iran"